Donald Trump. The very name inspires only class and luxury, as well as the finest hand gestures and hair around. While I may not support his run for President, I did enjoy the slogan, but the gear left… well, a LOT to be desired. For a man who likes to have gold in all of his buildings and his name in giant letter, the hat leaves a lot to be desired. Ladies and gentlemen, this is the classiest, most luxurious design of this slogan that you will ever see! Donald Trump, if you would like to use it for your campaign, have your people contact me and we can work something out. June 2011 – The Fierce Demoness Wallpaper! After much delay, I am pleased to bring back the monthly calendar wallpaper to the world! The Fierce Demoness is here to strike fear into the hearts of those who dare to cross her path! The propaganda-style will help to induct the poor saps who dare to resist her beauty! 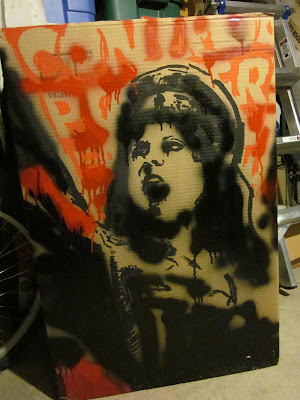 Spray Paint, I Think I Love You! To say there’s a bit of a disconnect between people who do street art and graffiti and everyone else is a bit of an understatement. For basically my entire life, I’ve had the viewpoint that most graffiti (99.99%) was junk and should be removed, especially on stuff around where I lived. I still think that, though the percentage is down to a whopping 98%. But about 2 years ago I met someone who actually just opened my eyes to this world. Through this person, I learned to appreciate it more and more as an art form, something I had begun doing for a while but this person really brought it out of me full-force. Tonight I finally took a plunge. No, I wasn’t tagging property. Instead, I decided to just decorate a piece of cardboard. Its actually a practice for a large piece I’m working on for the garage door. I was talking to a few people before I started tonight about what to do and how, exactly, to even start. Should I get those caps that adjust sizes? Should I get paint markers for small details? In the end, I learned a few things. For starters, next time I’m wearing a mask. The fumes, man, the fumes… Second, I’m better with a can than I thought. There was a lot of over-spray, I had more feathered edges than I would care for, but for the small piece on cardboard, it worked great! Seeing the paint slowly drip over the piece, especially the red, on a propaganda-style piece made it look even better to me! I need to get a new red paint marker, though; the hue on it is far too bright and pinkish, but that could change once everything dries. It was a ton of fun, I might do more pieces like this, and I’m looking forward to the garage door now. It’s safe to say that, while this event seems to be overblown, there is reason for people to get involved, if only to help others understand what’s going on out there. To that effect, I’ve created a flier with facts to help everyone out there. Also, 50% of all the profits from products with this image from now until May 22nd will be donated to the Red Cross. 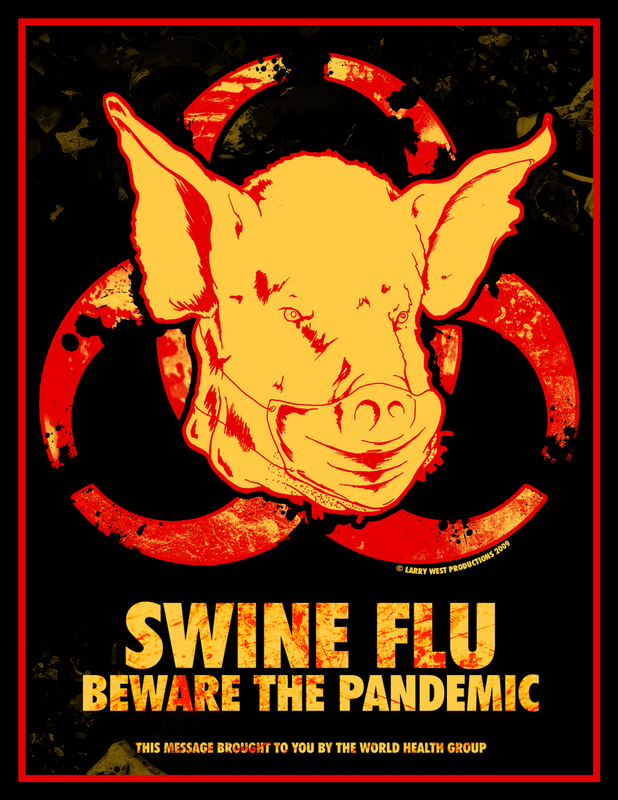 We are currently seeing this become close to being a Level 6 Pandemic by the World Health Organization. While I think we are all over-reacting right now, I wanted to do something to try and help educate people about this, as well as help a charity along the way.